WASHINGTON, D.C. (September 29, 2016) – Veteran service organizations (VSOs) and other advocates are congratulating Congress for approving fertility coverage for wounded veterans and their families. 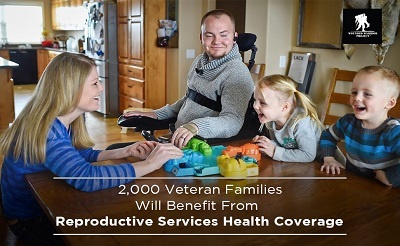 Without this coverage, an estimated 1,500 to 2,000 veterans would be unable to start or grow their family due to their injuries sustained in service to our country. The passage of H.R. 5325 fills a longstanding gap in health care services available to veterans. Due to injuries ranging from post-traumatic stress disorder (PTSD) to damage to the spinal cord, many veterans returned home from combat having lost the ability to have children naturally. While the Department of Defense offers fertility treatment for service members injured while on active duty, this benefit was not previously available to wounded veterans. Following Wednesday’s action by Congress, the Department of Veterans Affairs (VA) will be able to cover fertility treatments for veterans with service-related infertility. Over the past several months, a broad coalition of VSOs and partners including Wounded Warrior Project® (WWP), Disabled American Veterans® (DAV), National Military Family Association (NMFA), Paralyzed Veterans of America (PVA), Bob Woodruff Foundation, Military Order of the Purple Heart (MOPH), AMVETS, Blinded Veterans Association, Service Women’s Action Network (SWAN), Vietnam Veterans of America® (VVA), Quality of Life Foundation, Blue Star Families, Elizabeth Dole Foundation, Military Officers Association of America (MOAA), Iraq and Afghanistan Veterans of America (IAVA), Tragedy Assistance Program for Survivors (TAPS), and The Veterans Health Council joined together to fight for the men and women who sacrificed for us.